← Old Playa Del Carmen, Is The Real Playa Del Carmen, So Check It Out! Local Xcalak Micro-Brew/Distillery Products Now At The Tropicante!! When I get asked, ” where is Mahahual Mexico”, I tell them we are on the other side of nowhere. Almost Belize. The thing is, we’re not the last stop on the road. There is actually a place on the other side of, the other side of nowhere, and that is Xcalak, Mexico. This tiny little village is about 45 minutes south of us in Mahahual, and the last stop at the end of Mexico. 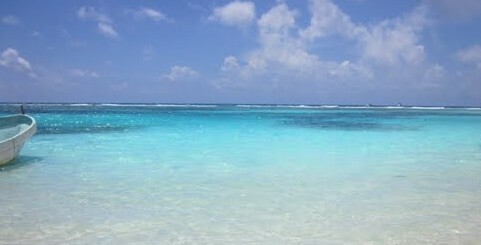 Keep walking and you’ll be swimming before too many steps, with the next stop being Belizian waters. Not much in Xcalak actually, but it is home to one of the most pristine tropical ambiance you’ll find in Mexico. The Caribbean waters are some of the most protected in Mexico and the low density regulations make it such that there are far more iguanas than people. It is the best diving in the area, as well as blue ribbon fly fishing, and a birder’s paradise. All of that is great but to tell you the truth, none of that is good enough to get me to go all the way to Xcalak. I mean, come on, its on the other side of, the other side of nowhere! But there is one little known secret that can get even me to travel all the way down there; and that is the homemade beer and moonshine at the Costa De Cocos hotel! Yes, there seems to be a little more than great diving and fishing down that way, and it comes in 16 ounce glasses. Dave and Ilana Randall, and their little boutique hotel Costa De Cocos, are very well known in the international fly fishing and diving worlds, with articles about their place all over the internet and print world for years now. They cater mainly to fly fisherman wanting to fish the Chetumal Bay area in search of a very do-able grand slam of fly fishing. Bonefish, permit, snook and tarpon are all in those waters and very catchable for the best anglers, and many try Xcalak year around. Divers are their other big clientle with the waters off the shores of Xcalak part of a federally protected marine area that connects to Banco Chinchorro, Mexico’s crown jewel of diving. Throw in a few birders wanting to see many of the almost 400 species of tropical birds in the area, and Xcalak, and Costa de Cocos, are a world-class tropical destination. As if that is not enough, Dave has doubled down and now decided to go after another even larger demographic; the beer and whiskey drinker! A few years ago he began to make his own moonshine, which moved to making specialty moonshines and then into brewing fine beers. His operation continued to grow and the process became more finely tuned, and today, his micro brew/distillery is making some truly fine beers and spirits. He only has one problem. He and his guests, no matter how hard they try, can’t drink it all. They sell it to all in Xcalak, which can’t be more than a few hundred, and they try to drink the rest and just can’t do it. That is where we came in. Xcalak is just too far for our cruise ship tourist in Mahahual to travel on a short visit day, so for those craft brew beer drinkers on the ship, they are usually out of luck. Many of our hotel visitors travel to Mahahual via bus, and getting the rest of the way to Xcalak, is often too hard for them too. So getting the thousands of tourist who come here to ever find such a far away and off the beaten track micro brewery is not going to happen. So we decided to bring the brewery to Mahahual instead. The Tropicante is happy to be working with Dave and Ilana, and are now the official outlet for all the Costa De Cocos Brew and distillery products. That means cruise ship passengers and hotel guests can now enjoy their high quality beers and spirits, without having to travel all the way to the other side, of the other side of nowhere! Available on tap now are Sunrise Amber Ale, Tarpon Pale Ale and Permit Porter, with a still to be name citrus wheat beer to be added in the next few weeks. All are rich, full flavored beers and every bit as good as craft brews in the states. We think they are better than most and are very excited to be selling them at the Tropicante. In addition to the brews, we will also be selling his moonshines. His smooth, clear Mula Blanca corn whiskey, is the original, and that quickly led to his hot pepper version. Now, they have added both coconut and butterscotch moonshines, with even more still to come. Each will be available at the bar by the shot, so you can try them all. So now you can enjoy the Costa De Cocos specialty brews and spirits without having to travel through the deep, dark, snake and jaguar infested jungles that surround Xcalak. stay in Mahahual and instead go to the Tropicante to enjoy a fine craft brewed beer or the equally fine moonshine whiskey. If nothing else, the drive home is shorter! 1 Response to Local Xcalak Micro-Brew/Distillery Products Now At The Tropicante! !